Papers on the cataloging of electronic resources have focused on electronic journals and Internet resources such as Web sites and not on electronic books. Electronic books are nonserial monographic resources accessed with a computer either directly or remotely. Rules and standards for cataloging electronic resourc-es have changed and continue to change. 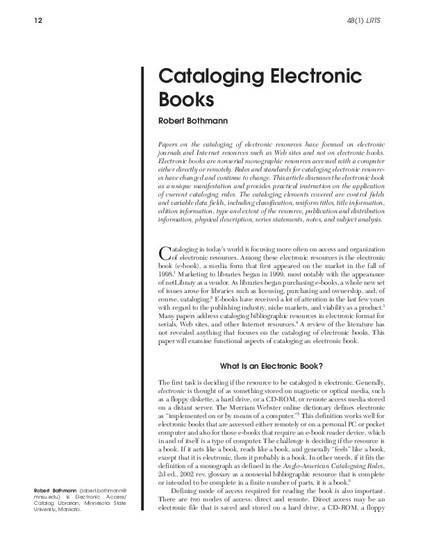 This article discusses the electronic book as a unique manifestation and provides practical instruction on the application of current cataloging rules. The cataloging elements covered are control fields and variable data fields, including classification, uniform titles, title information, edition information, type and extent of the resource, publication and distribution information, physical description, series statements, notes, and subject analysis. Copyright © 2004 American Library Association. Reprinted with permission. Original published in Library Resources and Technical Services, volume 48, issue number 1, January 2004, pages 12-19. Available online: http://www.ala.org/alcts/sites/ala.org.alcts/files/content/resources/lrts/archive/48n1.pdf. Bothmann, Robert. 2004. "Cataloging Electronic Books." Library Resources & Technical Services 48 (1): 12-19.